It’s been awhile! Over the last few months I’ve felt so guilty for not posting on this blog. I mean it has been ages! Day after day, as I’ve struggled to keep up with life in general…which for me means trying to maintain a good balance between being a wife and mom, and being a debut author, I would think of my five year-old blog fondly, and wish I could stop by for a chat. I’ve seriously chastised myself over and over for neglecting it, which is so ridiculous, I know. But I do miss blogging and I’ve seriously had so many things to post about. But to be honest, this year has been a whirlwind—both personally and professionally and I just had to place this blog on the back-burner, much to my dismay. That doesn’t mean I haven’t checked in on this site though. I actually check in often, like several times a week to update it—or at least make sure it doesn’t need urgent attention. But finally today, I decided to take a break from the other things. I’m currently in the middle of holiday prep—like so many of you and also in the middle of drafting. I’m working on a middle grade novel and one day soon, as soon as it’s in a more complete form, I’ll share the details with you. But for now, I’m keeping my fingers on the keyboard and pressing on. I have thousands of words left to write. Thousands. I know that’s pretty vague, but I’ve learned that when I say exactly how many words I’ve written, I feel pretty crappy when the next time I talk about it, the number has not increased as much as I’d like. So for now, all I’ll say is that my goal word count is 60,000 and I have a ways to go! As you guys know, I had two books publish this year…my first two! That’s basically why this year has been a little crazy. Spin the Golden Light Bulb released in January and Flip the Silver Switch released in August. I had so many questions leading into my debut year. There were so many unknowns for me. But I was in a pretty unique position in that I had a chance for a do-over with my second release. That doesn’t mean I didn’t mess up a lot of stuff the second time around though. It’s forever been a figure it out as I go kind of year. So because of that, I’m working on a post that will give you the inside scoop on what the debut year of a published author is really like. I have lots of tips (and reality checks) for you. Hopefully you’ll find some of it to be helpful! Stay tuned. I’ll be posting it soon after the one year mark, which is January 9, 2019! Spin the Golden Light Bulb has just been named by the Children’s Book Council and the National Science Teachers of America to their 2019 list of BEST STEM BOOKS K-12! Like, what?? Are you kidding? I’m thrilled, ecstatic, honored, and still in a state of absolute disbelief! STEM education is an initiative to get kids excited to learn about science, technology, engineering, and math. This list recommends books that inspire innovation as student’s improve their reading skills. As many of you know, Spin the Golden Light Bulb was inspired by the Odyssey of the Mind program and my team of 11 year-olds who once upon a time competed at the World Finals. Their story inspired me more than I can say, and I had hoped to write a story that would inspired other kids too. To think that prestigious organizations like these believe that my book does that, is truly a dream come true. I’m beyond grateful that Spin the Golden Light Bulb is included on this list along side many other authors that I admire. It’s more than I ever expected or dreamed for my first published book! Cheers to the end of 2018, and all the words we’ll be writing before the calendar page flips again! It’s Swirl and Spark’s 5 Year Blogiversary Giveaway! Just five years ago, on August 16, 2013, I took the leap and started a blog. A blog called Swirl and Spark…the site for kids who like to write. What began as a way to create a social media platform as a writer and reach my someday readers has evolved a bit through the years. I wrote my posts for kids at first, but quickly realized that the majority of people reading were adults—adult writers. And so the tagline soon became the site for kids at heart who like to write. But eventually, after several years, I finally needed an author site. So even though my blog is still written for writers, my website also needed to be a landing place for my books and a place to chat about all things publishing too. It was tough as first, finding my groove and figuring out who I was writing for at first. Seasoned writers? Beginners? Published? Not yet published? But once I realized that blogging is nothing more than writing to a reader (whether that’s one reader or 1,000) it became much easier. Blogging became a way of sharing a bit of my life as a writer with anyone who was interested in reading. It became a means to be creative—in my own personal corner of the blogosphere. Some days I love blogging. I love writing posts and sharing bits of myself with all of you. Some days it’s hard. Finding the right (or relevant) topic year after year for an audience can be time consuming and sometimes the words Just. Are. Not. There. But somedays they are, and that’s when blogging can be great—a great way to connect with other people with the same interests. I wear my heart on my sleeve with whatever I write. That’s just me. Sometimes my posts ramble! But maybe you’ve also noticed long periods of time when I haven’t posted much at all. That usually means that I’m stressed or overwhelmed—or just not ready to share what’s going on. My zodiac sign is Cancer, so for those of you who are into that sort of stuff (like me!) you know that makes perfect sense. I retreat into my shell once in a while. But when I come out, I’m all about sharing—usually oversharing! So this blog has been a fun tool for my creative oversharing side! There’ve been many highlights on this blog over the years and a few really stand out. Back on August 16th, 2013, shortly after my first post went live, I checked my stats numbers and saw 156 views…on my very first post! I screamed throughout the house until I realized that the views had come from my own computer! I hadn’t learned there was an admin mode and so every time I clicked on a page, it was recorded as a page view! Alas, after that it took a very long time to even see one or two views! Soon after, still watching my stats like a hawk, I saw thirty views in a fifteen minute span. I yelled again throughout the house, “Guys, someone’s on my blog! They’re clicking on every page!” A small voice from the bedroom upstairs called, “Sorry, Mom. I think that might be me.” Now how could I be mad that it actually was my 13 year-old son reading my blog? Does anyone remember Critique Corner? It started as a critique session for kids and evolved into a middle grade and YA critique session for adult writers. It was fun while it lasted…but so much work! Maybe I should start it back up again?? One follower of this blog reached out to me asking if I’d was interested in being on-line Critique Partners. She caught me at just the right time in my writing life and not only did she become an amazing CP, but I now consider her a friend. I’m certain that neither of my books would have been published without her. Her name is Melyssa Mercado and if you’re not following her on Twitter, you should be. She’s hilarious and I have a strong feeling you’ll be reading her MG books one day soon! Back when the blog started, I was un-agented and unpublished. Being able to share stories of both right here on this blog were definitely two huge highlights. And for those of you wondering, both my agent and my publisher said that although my writing and my story came first in their decisions to take me on, it didn’t hurt that I had this blog as an on-line presence! So for those of you wondering if you should hop on the blog-wagon, I say DO IT. I’ll most definitely check it out. The biggest highlight by far though has been comments and emails from all of you. Knowing that what I’ve written has made an impression and inspired you somehow, has made all the hours spent on this blog worth it! Sometimes it takes a friend…to help make your dreams come true. Sometimes it takes a whole team…to help you see things clearly. So hopefully I’ve been that friend or teammate for you. Hopefully I can continue to be. Because if I can get published, anyone can. You just need the courage to believe it. Thank you all from the bottom of my heart for reading and following this blog. I know there are many other places on line where you could be hanging out. The fact that you choose to check in with me, means the world! So as a thank you, I thought today would be a great time to do a Swirl and Spark 5 Year Blogiversary Giveaway! I’m giving away 5 prizes! (1) Critique of one manuscript chapter from me…up to ten pages. I’ll provide feedback on plot, characters, dialogue, voice, and pacing… and make line edits (grammar and punctuation) as well. (1) Critique of two manuscript chapters from me…up to twenty pages. I’ll provide feedback on plot, characters, dialogue, voice, and pacing… and line edits (grammar and punctuation) as well. (1) The Crimson Five Book Bundle which includes the items below: a signed hardcover copy of my debut middle grade, Spin the Golden Light Bulb, a signed hardcover copy of the sequel, Flip the Silver Switch, coordinating signed bookmarks, and celebratory lollipops…because who doesn’t love lollipops? (1) The Crimson Five Book Bundle plus Bracelet which includes the items below: a signed hardcover copy of my debut, Spin the Golden Light Bulb, the newly released sequel, Flip the Silver Switch, coordinating signed bookmarks, and celebratory lollipops…because lollipops! And also a cute DREAM bracelet which I hope will inspire you to reach for yours! (1) $25 Barnes & Noble Gift card…because, we all love books, right? And if you’re a writer working toward publication, one way to become a better writer is to read widely in your genre. So hopefully a gift card will help! The Giveaway is open to residents of the US and Canada only and you must be 18 to enter. Follow this blog (on the right side of this page). Retweet my Blogiversary Giveaway tweet and follow me on Twitter. Good luck! Thanks for helping me celebrate 5 years of blogging! Have a wonderful day, Lovelies…and I hope you win! To Launch Party or Not to Launch Party? 7 Days!! Ohmygosh, we’re one week out from release of Flip the Silver Switch and I’m not gonna lie. It is NOT easier the second time around! I was thinking I would be a seasoned pro by the time my second book published but here we are seven months later and NOPE—not a seasoned pro at all! I am most definitely freaking out. But… people are going to be reading my book in just 7 short days. And what if none of the bookstores stock this one? What if librarians say, “No thanks?” What if it gets bad reviews? What if I haven’t done all I can to help promote it? What if it doesn’t sell at all? What if no one comes to my launch party? Take care of the things you can control, and forget about the rest. Yes, people are going to read my book. That’s a good thing! My story will soon be in the hands of readers and that’s why I wrote it, right? So no reason to be anxious at all. And, Amberjack has an incredible sales and marketing team. They are professionals—the experts at that sort of thing. Sure, I can use my social media platform to help spread the word about it—and I have, but at the end of the day, I have little control over sales. I’ve done the hard part. I’ve written the best book I can. Hopefully there will be booksellers, librarians, and readers who love the story as much as I do…as much as my agent does, and as much as my team at Amberjack does. Fingers crossed on that one! What if no one comes to my launch party? This was my BIG worry for the launch of Spin the Golden Light Bulb. It was a private event and I had invited my family and closest friends not knowing how many of them would come. And if they did attend, I was convinced they would stop in for a few minutes just to be nice! Well, many DID attend (like over 100 people!) and though I’ll never know how many of them came just to be nice, they were there for the whole duration and it was wonderful—definitely a night I will never forget! But, that night was only seven months ago. How could I ask my family and friends to attend another launch party for me? It was strange enough the first time hosting a party for myself. No way was I going to do that again! Besides, it was a lot of work to organize and I wasn’t sure I had it in me again so soon. So I decided not to have one. To launch party or not? Yes!! We’re having a launch party! Details for the event can be found here on my Facebook Author Page and also on the EVENTS page. But don’t think for a second that I’m not a teeny bit anxious. Like I said, giving birth to a book is a BIG DEAL! But that’s not all my news today. In keeping with the celebratory theme, I mentioned last time that I’m celebrating the 5 year Blog-iversary of Swirl and Spark with a Giveaway!! I’ll be posting all the good stuff on Thursday, the actual 5 year Blog-iversary date! Check back then because I’m certain you’ll want to enter. Don’t forget. And don’t forget to tell your friends. I think they may want to enter too! Until then, I’ll be spending most of this week finalizing college prep stuff for my two kids. I mentioned last time that my son leaves for college on the 19th. Yes, the 19th. That’s so soon! My daughter has a week longer but also so much stuff to do before her first day back too. So…pretty busy in this household as we gear up for the Blog-iversary, College send off, Flip the Silver Switch Release Day, and Flip the Silver Switch Launch Party! Have I mentioned I really can’t wait for September?? Did you notice that I made no mention of writing? That’s one reason I really can’t wait for September. I’m looking so forward to diving back into my WIP. But what about you? Have you been writing lately? The lazy days of summer are upon us (well for some of us) so I hope you’re one of those lucky ones enjoying the tranquility! But I hope you’re writing too—or at least thinking about your story. That counts as writing too. Without the calm thinking time, there can be no creative ideas. Our minds just don’t work that way. So enjoy the calm as much as you can. That’s when the best story ideas come to us. Have a great day, Lovelies and I’ll check in with you on Thursday, August 16th for the 5 YEAR SWIRL AND SPARK BLOG-IVERSARY!! I just returned from the most wonderful family vacation ever…a little Disney World time, and a little Hilton Head, SC time. It was busy and crazy and hot and magical and relaxing and full of fantastic family memories made with my husband, my kids, and my parents. Definitely a trip I won’t soon forget! I’m so grateful for these moments because life gets so busy sometimes… and I realize more and more all the time how important it is to spend time with the people most important to you. I was not able to fit in any writing time at all though, but I did brainstorm a shiny new story idea on the LONG drive home. So that’s something! I also came up with the greatest non- writing idea ever—a new project and I hope you love it as much as I do! I’m on the hunt for middle grade book trailers! I’ve created something called the Middle Grade Book Trailer Trail where I search for MG book trailers and give them a permanent home here on my website—a go-to place where you can peruse the page and watch them at your leisure . Many of you know how much I adore book trailers. I just can’t get enough of them. They’re the best way ever to take a peek inside the pages of a book before you actually flip open the cover. I not only love watching them in order to find out what the book is going to be about, but also to see the creative expression behind them. It doesn’t matter to me if they’re created professionally or by the author themselves. It’s just cool to see what type they put together. Will it be dark and creepy? Will it be sad and heart-wrenching? Will it be light and airy? Will there be real actors or regular kids? Will there be actual illustrations from the book? Will there be a voice recorded over music? Will it look like a Hollywood production or will it look like the author filmed it in the woods behind her house on her phone? It doesn’t really matter to me, because I think they’re all good, in their own way—like a few minutes of book bliss set to music! I decided to do it because I’ve had a really hard time finding MG book trailers, even on YouTube. It seems as though as soon as an author uploads one, it’s lost into the black hole of a gazillion other videos—which is such a travesty. I mean where are they all? Authors like me spend a lot of time and sometimes money planning, writing, editing, filming, and costuming to create them. We send them out into the world for readers to watch and some do. But then time goes by and well, they disappear. It’s not because they aren’t there anymore, but if a reader doesn’t know to look for your name or your book’s title, they’ll never find it. It’s frustrating because I know that librarians, teachers, parents, kids, and bloggers probably love watching them as much as I do. So, I’ve taken matters into my own hands. I’m reaching out to anyone and everyone on social media who is or knows of an author with a middle grade book trailer. (Email me if you are and want yours to be included!) I want to find the latest and greatest in new middle grade books, and then share their book trailers with all with you! I started with my amazing debut author group, the Electric 18s and they were more than happy to share their trailers with me. Some of these books published earlier this year, and others will be published by the end of the year. But either way, I know you’re going to love them. They are so good! They definitely make me want to go out and buy their books or request them at the library. I’ll be posting them as I receive them, but the first two are up already. The Mad Wolf’s Daughter (Diane Magras) and The Benefits of Being an Octopus (Ann Braden) are up first and I’ve posted them over on the MG BOOK TRAILER TRAIL page…but if you’re a YouTube kind of person, I’ve also set up a link to my YouTube channel so you can scroll through them one right after the other—like if you’re in a book trailer binging type of mood like I often am! So click on over and take a peek. Both of these trailers are so good! I’d love to know what you think of this book trailer hunting adventure. I know I cannot possibly be the only one who loves watching them! So, if you know any young readers, librarians, teachers, parents, or friends who might be interested in learning about new middle grade books this way, please direct them to my site or to my YouTube channel. I want them to be able to watch them too! That’s it for today, guys. I hope you’re enjoying the summer. Keep writing, reading, and thinking up stories. The world is waiting to read them! Have a great day…I’m off to search for more MG trailers. If you find any great ones (well, they’re all great actually!) please send them my way. I’d love to watch, and them give them a home right here! Have you ever had a week (or four!) that’s so topsy-turvy and busy that all you crave is a chance to catch your breath, a chance to answer emails or even write a blog post? Well, this week I certainly wished for a chance to catch my breath, but I should have been more aware of what I was wishing for! This week marked moving day for my parents…a move out of the home they had lived in for 42 years—the home I grew up in. They sold their house months ago, but when it came right down to it, suddenly moving day was here. There was packing to do, boxes to move, and I had to say goodbye to my childhood home—just like that. The flashbacks of amazing memories filled my every waking thought but as busy and emotional as it was, it was wonderful to spend so much time with my parents, my siblings and their spouses, my nieces and nephews, my husband and my own kids…because we’ve all lived so much life in that house. But now that my parents are sort of settled into their beautiful smaller home, I’m reminded how important family is…no matter where it is you call home. This week also marked an end to my son’s high school sports career. But because he’s my youngest, it marked the end of all high school sports for my husband and I—and that just feels strange. Bittersweet to be sure. It also marks just three weeks until my son’s graduation and I wish I could slow down these days—just a little bit. There’s Senior Ball still to come, and Senior Banquet, graduation and a grad party to plan…packed into just days. But just like with my parents’ move, the days are moving full steam ahead whether I’m ready or not and so I’m just trying to savor every moment, while I hold on just a little tighter. A little over a week ago, I debuted the book trailer to Flip the Silver Switch. But as excited as I was to share that, I secretly wished that I had more time before release day. Spin the Golden Light Bulb is still a newborn book and dealing with two books at once had begun to feel overwhelming. I was desperately afraid that I wouldn’t be able to promote FTSS properly or celebrate its release into the world the right way. I secretly wished that the release date was back to its original one in August. Over the weekend, I struggled to complete even a quarter of my to-do list… mostly yard work, laundry, and house work. I mean there are only so many hours in the day! Instead though, on this holiday weekend, I spent time with my family and it felt good to rejuvenate—even though I knew I would pay for it this week. But there’s nothing more important than spending time with the people that mean the most to you so I enjoyed every second…except one particular moment last night. Remember I said that I wished for time to just breath–answer an email or two? Well, last night after a fun Memorial Day picnic at my brother’s home, I said good bye to everyone and proceeded to slip down his deck stairs. I fell down only two steps but as one of my feet slipped out from under me, my back crashed against the wooded step. I’m not sure if I knocked the wind out of myself or what, but the pain was excruciating, I was dizzy instantly, and felt ringing in my ears. Yeah, that was fun. So I spent the night with ice and ibuprofen and today on the couch. I guess I got what I wished for…a chance to answer emails and write my blog post! But, another thing happened that I secretly wish for too. Flip the Silver Switch has a new release date! It’s August 21st…its original release date! I got the email about it today. How crazy is that? I know some authors would be upset, but not me! This means Flip the Silver Switch will be promoted as a Fall/ Back to School book and I’ll have more time to promote it and give it a proper launch into the world—after I’ve had time to properly plan a graduation party and send my son off to college! So there you have it. Sometimes the unpredictability of publishing can work to your advantage. I guess I better update the release day countdown counter on my site, and then ice my back again. There’s no way I’m spending another full day like this! But at least my emails are now caught up and if it hurts still tomorrow, I could get some writing done. Imagine that! Have a great week, my friends! Don’t forget to take some time for yourselves. It really does help! Spring is in the air and one of my favorite springtime colors is purple—the color of beautiful lilacs! Here in my hometown of Rochester, the Lilac Festival is a massive event. It draws people from all over. So, I thought what better time to debut the book trailer for my purple covered middle grade book than right now, right in the midst of the Lilac Festival? 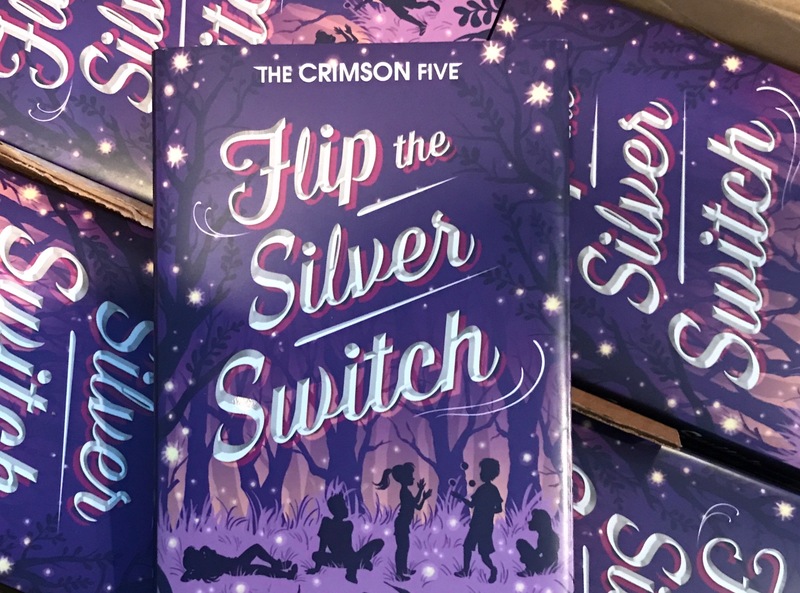 For those of you not in the know, the book I’m referring to is Flip the Silver Switch, my second soon-to-be-published middle grade book (can you even believe it? ), which just happens to be the sequel to Spin the Golden Light Bulb. It releases in 53 days on July 10, 2018 and I could not be more excited to share it with you! It was so much fun creating this video. Hopefully it’ll give you a sense of the amazing world of THE CRIMSON FIVE, this time against an international backdrop, and that you’ll be tempted to read it for yourselves! Be Curious. Be Creative. Be Collaborative. Be Colorful. Be Courageous. Fresh off their summer at Camp Piedmont, The Crimson Five kids are together again, headed for the Piedmont Global Championships. This time, Kia and her four New York teammates travel to Quebec where they’re challenged to solve a new mind-bending task against 99 international teams. But at the Universite de Creativite, they discover a world where inventions like Thought Translation Machines and Clothes Copiers aren’t the only secrets kept. While Kia, Ander, Mare, Jax, and Jillian attempt to create a life-changing invention in just two weeks, they’re faced with information that could alter the course of the Global Championships and force their team out of the competition. With their newfound friendship at stake, they realize that staying in Quebec and solving the Global task will require something more than just skill and imagination. The team must focus and unite like never before to solve their hardest task yet if they have any chance of winning a coveted spot on the year-long Swirl and Spark Creativity Tour and keeping their team together. The Crimson Five are together again. Because sometimes it takes a whole team to help you see things clearly. Well, I hope you enjoy it! Feel free to share this post everywhere…and thank you so much for watching! To add it on Goodreads, click here. To pre-order from Amazon, click here. To pre-order from Barnes & Noble, click here. To pre-order from an independent bookseller, click here.